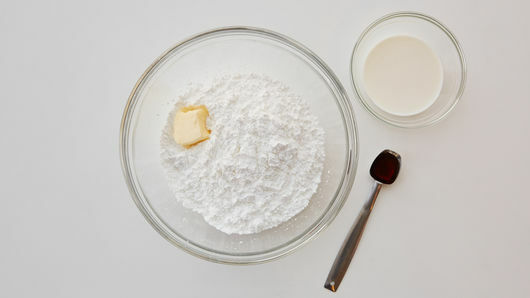 In medium bowl, combine all ingredients until smooth, adding enough milk for desired glaze consistency. Use to glaze cakes, coffee cakes or pastries. Chocolate Glaze: Add 2 oz. unsweetened chocolate, melted, or 2 envelopes premelted unsweetened chocolate. Coffee Glaze: Substitute hot water for milk. Dissolve 1 teaspoon instant coffee granules or crystals in the hot water. Lemon Glaze: Substitute 2 tablespoons lemon juice for part of milk and add 1 teaspoon grated lemon peel. Maple Glaze: Add 1/2 teaspoon maple extract or flavor. Orange Glaze: Substitute orange juice for milk and add 1 teaspoon grated orange peel. Spice Glaze: Combine 1/4 teaspoon cinnamon and 1/8 teaspoon nutmeg with powdered sugar. 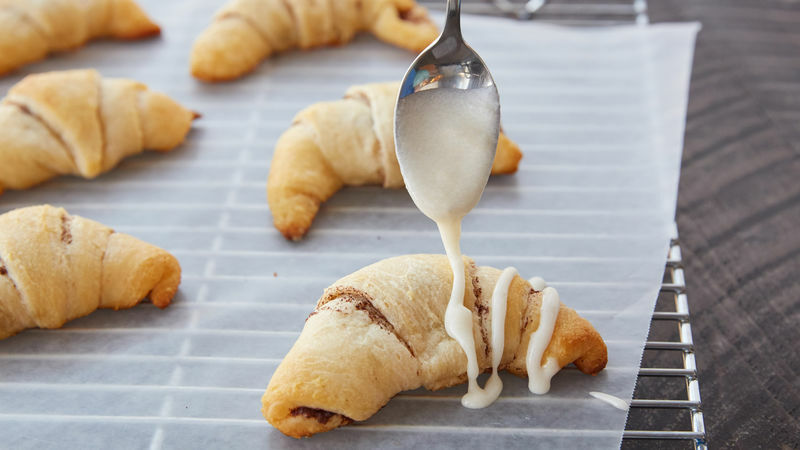 Decorating pastries and desserts doesn’t get much easier than with this powdered sugar icing recipe. You can whip this up in minutes with ingredients that are probably already sitting in your pantry and refrigerator. Keep adding liquid one tablespoon at a time to make this glaze as thin or as thick as you want. When it comes to drizzling techniques, there’s no exact science. You can simply take a spoon, take a small scoop of icing and run it over your treats. If you want to be more precise and are hoping for a pretty presentation for a party or special gathering, you can also pour your icing into a plastic bag, seal it and cut off the corner of the bag to drizzle the icing. Serving doughnuts? Go ahead and dunk the top of the doughnut in this icing for an extra sweet morning treat! Now that you have this recipe in your back pocket, it’s time to try it out on a bunch of different desserts. Explore all of our best dessert recipes and get baking!